If you watch television, you’ve seen the Anchorman 2/Dodge Durango ads. They’re kind of hard to miss. And, strangely, they’ve sparked many a water-cooler discussion about whether they’re a Durango ad or an Anchorman 2 promotion. Then, of course, there was Ron Burgundy’s blistering interview on Conan that, quite frankly, made me cringe and then say, “Really? Dude, you just got PAID….” But, in Hollywood, any press is good press, right? Regardless of anything you see on television, the reviews from those who actually know what they’re talking about (sorry Ron Burgundy) are in and the 2014 Dodge Durango is scoring big. In a word, the new eight-speed is excellent: when paired to the Hemi engine it’s assertive when it needs to be, smooth when it isn’t being assertive. We drove up the sort of fiendish, twisty roads that full-sized crossovers have no business being on unless helmed by hapless dads looking for the freeway. Griswold himself would have nodded in acknowledgement. Yet as the elevation grew and the curves unwound, the transmission never hunted for gears, it was never flustered by our varying throttle inputs. The Hemi 5.7-liter V8 never felt strained. The 2014 Dodge Durango is the rare SUV that isn’t just a tall station wagon with tough-guy styling cues. Based on the Jeep Grand Cherokee, the Durango’s rear-wheel-drive platform gives it real credibility as a workhorse, whether you’re towing things or heading off-road. Yet the Grand Cherokee’s carlike ride and handling are present here, as well, so the Durango gives up nothing to the Ford Explorers of the world as a suburban errand-runner. Imagine that: an SUV that genuinely provides the best of both worlds. You want my opinion? The chiseled body style of the Durango sparks confidence with just a touch of arrogance. Its arrival demands respect. But, as form follows function, practicality must also fit into the sheer magnificence of this vehicle. So Dodge hooked it up with seven-passenger seating and up to 50 possible seating configurations allowing you to comfortably fit family and friends or load up for a weekend camping trip. The standard V6 engine has up to 6,200 pounds of towing capacity to get the job done, along with standard stability control, 4-wheel anti-lock disc brakes and six airbags to keep everyone safe. 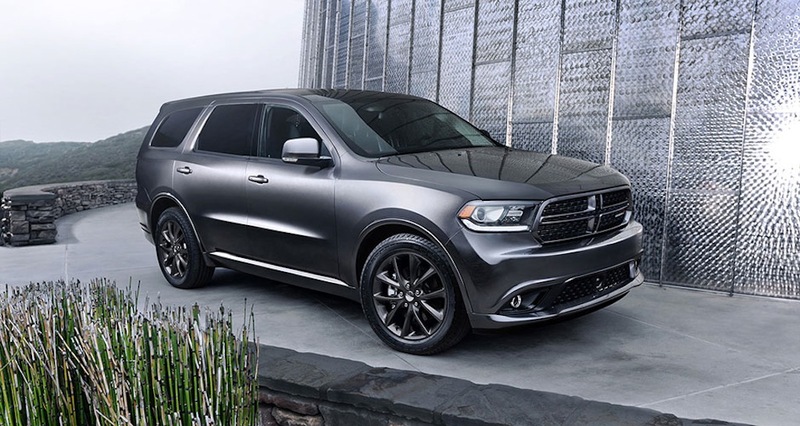 The Durango is the definition of power meets purpose. Sales on the 2014 Durango were up 59 percent in October. Some are crediting the Ron Burgundy commercials for this surge in sales. While I’m not foolish enough to say the ad campaign didn’t make people look twice at the Durango, ultimately people did do a test drive and that’s more likely what sold them on getting a Durango. Ron Burgundy, congratulations on being the outspoken, irreverent voice that got people’s attention. Dodge, congratulations on making a simply great vehicle that real people want to drive.